Captain Marvel’s name is on the poster, but Goose the cat steals the limelight in Carol Danvers’ first feature. Cranky, steadfast, and always ready to fight, Goose is the perfect sidekick. 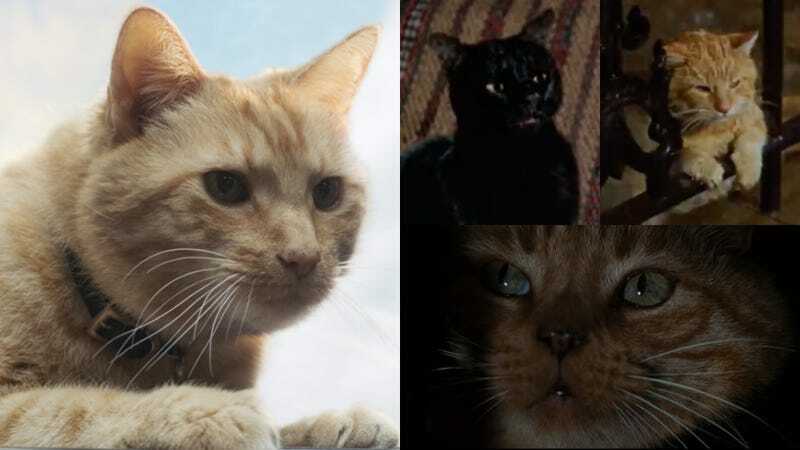 Played by four different cats—Reggie, Rizzo, Gonzo, and Archie—Goose joins Hollywood’s pantheon of near-sentient animal life guides, helping Carol as she struggles to find her place in the universe and retraces her way through her lost past. Animals on film have always held a special power over audiences: Old Yeller taught audiences the heartbreak of responsible love. Toto preached loyalty by defending Dorothy as she braved the perils of the yellow brick road. Willy the whale demonstrated the power of freedom. But it’s cats who penetrate that most human of emotions—fear. Symbolically, cats typically serve as guardians of lonely, independent women and femmes who are looking for space to call their own. Cat, Holly Golightly’s accepted tenant in Breakfast At Tiffany’s (1961), survival expert Jonesy from Alien (1979), and Hocus Pocus’ (1993) haughty Thackery Binx all carry an air of mystery and fierce devotion, and through them, more is revealed about their owners—and the human condition—than we humans could ever reveal on our own. Early depictions of witches are full of common household items: A cauldron. A broom. A cat. Black cats, in particular, have become symbolic of witches; in the Middle Ages, Pope Gregory IX proclaimed that witches were consorting with Lucifer disguised as a black cat. Followers would throw cats from bell towers, or burn them at the stake for fear that Lucifer might whisper in their ear. Thackery Binx from Hocus Pocus is a witch cat, a human child cursed by witches who were trying to steal his little sister. The witches were eventually executed for their crimes, but Binx couldn’t die, nor could he return to his human form. His own parent shooed him out of their path, unaware that their missing son had returned as a cat. And so, for 300 years, Binx—voiced by Jason Marsden in the film—has guarded the black flame candle, the witches’ only way to return to the living. Once the candle is lit, the witches will have one night to sacrifice a child to regain their youth and stay on Earth forever. Unfortunately, on All Hallows Eve, one very horny virgin trying to impress his crush decides to light the candle before Binx can stop him. But Binx’s devotion to his mission doesn’t end once the candle is lit. Instead, Binx doubles down on his efforts to make sure the witches can’t return to their physical form permanently. Following the children around, he encourages them to inform adults about what’s happening, and even whips out his claws against his witchy tormentors. Having survived so long on his own, accepting help tends to be a challenge for the street cat. “You’re going to turn me into one of those fat, useless, contented house cats,” he warns Dani (Thora Birch), the younger sister of the group. In this lament, Binx echoes Dani’s fear of being boring, like everyone else in her suburban town; but in the end, both Binx’s and Dani’s hearts have warmed up. They find that when they trust and rely on one another, they can conquer evil itself. Of course, not all cats are adorable boys from the 16th century magically converted into four-legged creatures. One of the more moving portrayals of a cat as its human’s id takes place in the film Breakfast At Tiffany’s, based on the 1958 Truman Capote novel. In the film, Holly Golightly (Audrey Hepburn) runs the New York City social life with her extra-long cigarette holder and outrageous fashion. Every woman wants to be her, and every guy wants to be with her. But, like any sensible girl, Holly just wants to be with her cat. Playing cool and unaffected, Holly refuses to even give the poor animal a name, referring to him only as “Cat.” When asked why, she explains, “We don’t belong to each other. He’s an independent, and so am I.” Golightly wants to live every day with spontaneity, while simultaneously searching for a permanent place to call home. Cat behaves in a similar fashion: Stalking the bookshelves and cabinets of her apartment, he looks down on Holly’s party with a mix of disdain and awe. Like Holly, he wants very much to be among people, while simultaneously hoping not to be the center of attention. Holly’s competing desires are so at odds with themselves that she throws Cat out into the rain to prove she’s an independent girl. But in truth, she’s a scared woman filled with self-loathing. “I’m like Cat here,” she says. “A no-name slob.” Despite her many accomplishments, Holly struggles to believe in her own self-worth, and it’s only when she claims Cat as hers that she begins to understand the true meaning of home. Meanwhile, in Ridley Scott’s 1979 sci-fi/horror hybrid Alien, Ripley’s (Sigourney Weaver) heart resides with her daughter back on her home planet of Earth. Despite the technological advances that make Ripley’s world so different from Holly’s world, there’s no substitute for a cat when it comes to keeping mice in check. And so the only cute and fuzzy thing on board Ripley’s ship, the glorified space tugboat the USCSS Nostromo, is Jonesy the cat. At the beginning of the film, Ripley and the rest of the crew of the Nostromo are awakened by an incoming distress symbol. But instead of fellow humans, the crew is instead greeted by parasitic aliens who lay eggs in human mouths and burst from their host’s chest as they’re being born. Exploring the horrors of birth, the chestburster rips through executive officer Kane’s (John Hurt) body like an angry newborn. But the film also juxtaposes the nightmare of labor with the beauty of motherhood through the character of Jonesy: For Ripley, whose strength and determination can be directly linked to her identity as a mother, Jonesy is a surrogate for the child at home she misses so terribly. An inevitable part of motherhood is separation from a child, but on this long-distance job, Ripley is unwilling to die without seeing her daughter at least one more time. And so, throughout Alien, Ripley chases Jonesy around the ship, doing her best to protect the cat. But Jonesy can protect himself. Wary of any help from strangers, he’s cautious about leaving his hiding spots, and instead of shrinking with fear when confronted by the alien, he hisses, spits, and swipes at the foul creature. His feline instincts make him a perfect foil for the audience, alternately cutting the tension with his adorable face and freaking the audience out as he tries to warn crew member of imminent danger. Together, using their wits and their physical strength, Jonesy and Ripley survive the aliens and make it back to humanity, mother and feline son. In Captain Marvel, Carol is also searching for her way back to humanity. After her identity is wiped from her memory, Carol traces a single clue about her past to Earth, eventually leading her to Goose. Carol’s mission is particularly difficult, because for six years she’s unknowingly been part of the Kree war machine responsible for oppressing the innocent Skrull people. There’s a lot to make up for, but feeling sorry for herself would only be a distraction. Like Carol, cats rarely feel sorry for themselves. They’re solution-oriented creatures. Goose doesn’t mope when she’s placed in a cage; she bides her time until she can escape, attack her problems head-on, and secure the tesseract. Throughout Captain Marvel, Carol goes through phases of self-doubt similar to Holly Golightly’s. But unlike Cat, Goose isn’t trying to detach from the madness. Goose is the madness, even though her secret identity allows her to blend into the background. Goose, like Carol, is a fish out of water. And like Carol, Goose is bigger on the inside, holding back powers no one would believe if they hadn’t seen it for themselves. Carol fears what her powers will reveal about her past, but she pushes on steadily, unable to rest until she knows the truth. Like all good cats, Goose is there to comfort when she’s so inclined, and point out enemies when they’re near, easing Carol’s fears. Acclimating to their new existences isn’t easy, but they manage it because they both have a mission to compete, making them true heroes. Together they inspire the creation of Earth’s best defense, the Avengers. The best cinematic cats give insight into the hidden depths of their human counterparts. Binx led with love, at first devoting his existence to avenging his sister before evolving to protecting the living. Cat was a guardian angel, a blessing Holly tried to throw away. Her self-discovery uncovered a home for Cat—he still didn’t get a name, but what’s in a name anyway? Jonesy represents the most primal symbiotic bond to known to man; no alien was going to sever the tether of motherhood between Ripley and her daughter—or her cat. Goose reveals Carol’s inner strength and independence, and becomes the key to discovering her past and banishing all the darkness in which the Kree steeped Carol. When Carol walks through that bright, shining door, embracing her flaws and her strength in equal measure, the impossible becomes possible. Feline intuition, retractable paw weapons, and a devil-may-care attitude make cats the ultimate survivors. All of the women and girls knew these cinematic cats were both feared and admired for their strengths, but had difficulty recognizing the power within themselves. Cats end up representing self-love for all of these women, and when they embraced that love, they were better able to serve mankind. They were heroes all along—they just needed a cat to remind them.